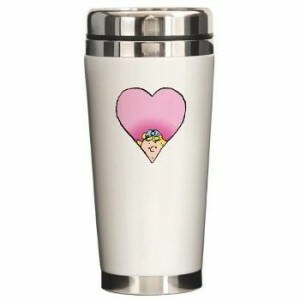 Sally Brown from the Peanuts gang is always a fun and loving character, so here she is on this travel mug playing peek-a-boo inside a nice soft pink heart. 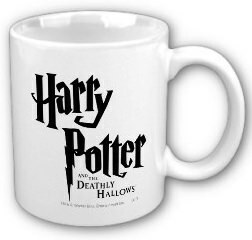 This travel mug is great quality with it’s stainless steel interior and ceramic outer shell. 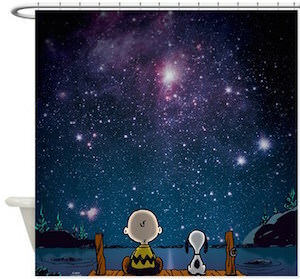 This will make a cool gift for your loved one. Find your Sally Peek-A-Boo Travel Mug. 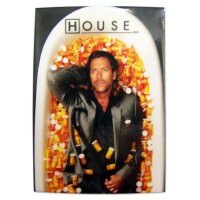 Dr. Gregory House is enjoying a bath in a a bathtub full of Vicodin. This is a great fridge magnet or maybe a great magnet for on your medicine cabinet (hope is made of metal). Batman fans check this out, you can take the Batmobile anywhere…Just put it in your pocket. 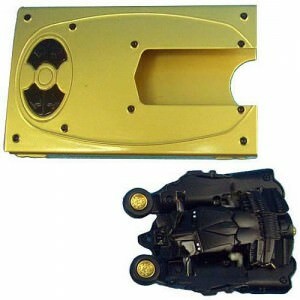 This is a super cool mini remote-control Batmobile, made by the aways quality and durable Hot Wheels. The Batman Batmobile folds flat to fit in the very thin case, with one pop of a button…BOOM! POW! this Hot Wheels Batmobile turns into a really awsome 3D functioning R/C vehicle. Measures 3 inches long, go check out the video on how super cool this Hot Wheels Batman Batmobile mini remote-control. See more about the Batman Hot Wheels Batmobile Mini R/C. 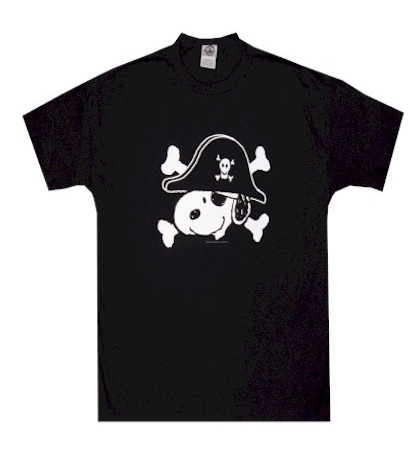 A nice black T-Shirt with pirate Snoopy on it. 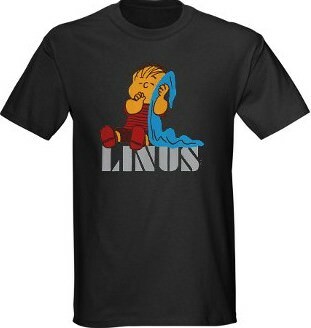 A great shirt for anybody I really can’t think of any one who would not love to have this Snoopy shirt. If you are a fan of Sherlock or to be more precise his enemy then you should take a look at this black tank top. This black women’s tank top is made from 100% cotton and has a racer back and on the front there you find a nice black and white picture of Moriarty which works really nice with the black background and below him a picture of a crown and the text “Honey you should see me in a crown”. And you can get this Sherlock tank top in junior sizes XSmall – 3XL and it will be one of those shirts you just love wearing. 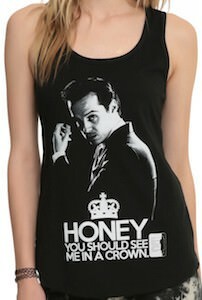 So why not order your own Sherlock Moriarty And A Crown Tank Top. 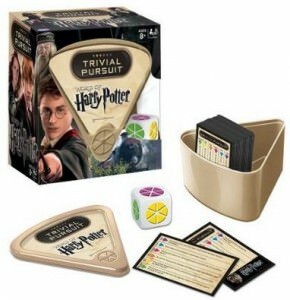 If you want to help Harry Potter fight Lord Voldemort then this is how you get ready. 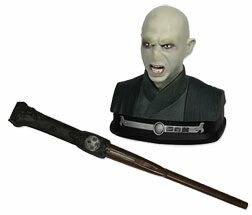 This bust of Voldemort will be your dueling partner. 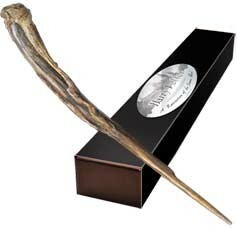 The infrared wand will make it possible for you to learn up to ten spell and learn how to fight you know who. What would be a better item to own then a coffee cup from the famous Luke’s Dinner from the hit TV series Gilmore Girls. Luke’s is the place to visit in Stars hollow when you are hungry or just want some great coffee. And now you can own this great looking coffee cup with the logo of Luke’s Dinner on it. Go get your Luke’s Diner Coffee Cup before the next rerun of the Gilmore Girls starts. Here are some real collector Star Wars Items that come all the way from Japan. 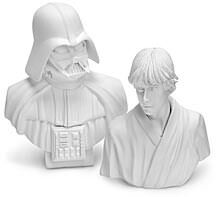 There are 6 different busts available and the average at an height of 3″. 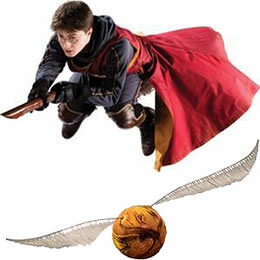 But you have to be quick because they is a limited supply and when they are gone they will never come again. Yes you are seeing this correctly! Luke Skywalker is the captain of the Rebel Alliance bobsled team and he has his favorite friends Chewbacca, Han Solo and C-3PO riding along and going for gold with him. 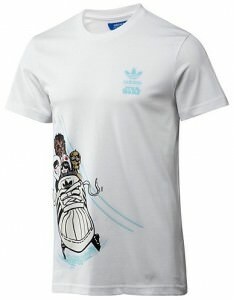 This Adidas t-shirt is an awsome shirt for the Star Wars fan and features 4 great characters from Star Wars riding in a bobsled that is shaped like an Adidas shoe. A very comfortable fitting t-shirt with a crew neck, find it in your size and support the Star Wars Rebel Alliance bobsled team today. Get your Star Wars Adidas Bobsled T-Shirt. 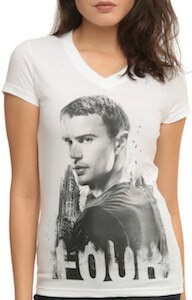 Fans of the Divergent series will love this women’s t-shirt of Tobias. This white t-shirt is made from 100% cotton and is available in junior sizes XSmall – XLarge. And this white v-neck t-shirt shows a big picture of Four looking over his shoulder with the the city in the background. If you look down his body then on the edge it says in big letters “FOUR” just as his name. The Divergent t-shirt is made for the release of the Insurgent movie and just is the perfect shirt for a true fan. If you like Four and Divergent then come check out this Insurgent Four T-Shirt.